I am always happy to say that I’m a proud graduate of Jim Hill High School. Just like West Jackson, Jim Hill often gets the negative comments from those who haven’t been to the school. But when it comes down to it, I must say that I received an EXCELLENT education there. I was enrolled in Jim Hill’s International Baccalaureate program and graduated from there in 2000 with my written skills in complete order. Why? Because Jim Hill’s IB Program emphasizes writing for everything. If you have a history exam, be prepared for a majority essay-based test. English Exam? Essay-based test. Math Exam? Okay, not essay based, but you get the point! So enough about me and my reflections. 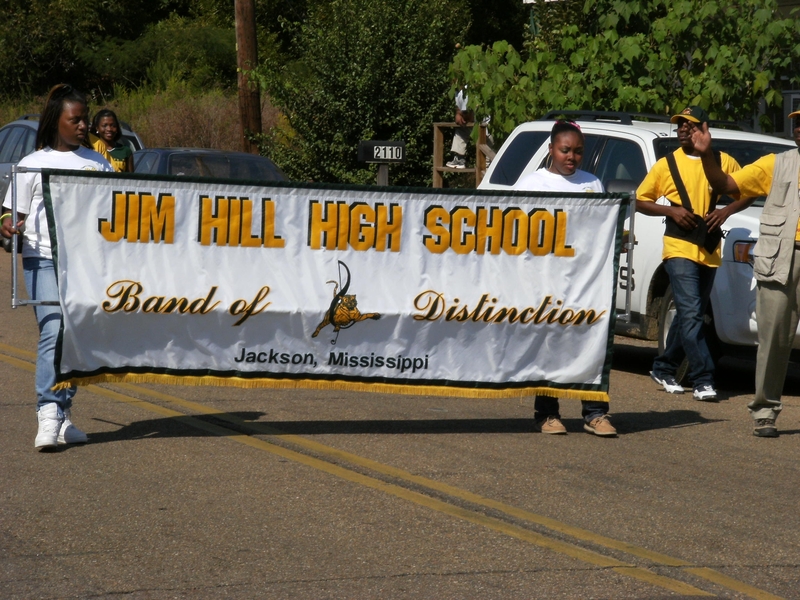 For those of you who are still reading, Jim Hill is celebrating its homecoming today. This morning, at 10 am, the school hosted a homecoming parade that featured bands, drill teams, community leaders, teachers, and, most importantly, the students. I must admit, the parade was extremely nice! There were even people attending the parade from various alumni classes including the classes of 1956, 1972, 1977, 1979, 1994, and 2000, among many others. It was also refreshing to see the familiar faces of teachers some teachers who taught me and are continuing the task of instructing our future. These teachers include Mrs. Barbara Hilliard, Major Branch, Ms. Carolyn White, Mrs. Linda Smith, Ms. Althea Stewart, Mr. James Hawkins, and Ms. Minnie York. If you don’t know much about Jim Hill, I urge you to learn more. I especially urge you to learn more about the International Baccalaureate Program. Jim Hill was the first school in Mississippi to offer IB, a program that is now offered in 8 other schools in Mississippi (4 of which are in the Jackson Public School District). Just in case you weren’t able to attend today’s parade, take a look at the pictures below. The Jim Hill Tigers will square off against the Hattiesburg Tigers tonight at 7 pm at Hughes Field. Uh, ooohhhh, GREEN & GOLD! To view these photos on our Facebook fan page, click here. Oh, and if you haven’t become a fan yet, click the “Like” button when you get there. Thanks!